The Pilates cat stretch is probably one of the most well known back stretching exercises you can do, and a favorite among our feline friends worldwide. Just look how happy and limber Pumpkin is after a long nap and doing his spine stretches! If done properly this back stretching exercise can be very effective at releasing the pain and tension up and down your spine. The way I am describing this cat back stretch focuses your attention on mobilizing your spine from your pelvis into flexion and extension. Work it smoothly like a wave flowing in the ocean! Get on your hands and knees with your hands directly under your shoulders and knees under your hips. Elbows should not be locked. Exhale as you press into your hands and up into your back as you gently rock your pelvis/hips under as if you were tucking your tail between your legs like a dog. Notice also how the back flexes like a cat arching its back. Shift about 60-70% of your weight back towards your heels with a small percentage of the weight on your hands. 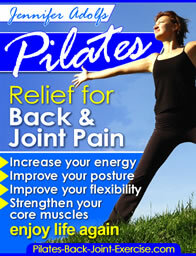 Find more great Pilates exercises compiled for you in the newly revised Pilates Ebook here. Inhale as you release your tailbone or push it out, lengthening it as you move your pelvis down and forward. Lift your chest and extend your spine long keeping your stomach muscles tight. Think of lengthening out your spine from the crown of your head to your tailbone as you stick your rear end out. Notes: Move slowly in and out of this cat stretch exercise as you flex and extend your spine by rocking your hips and pelvis. Stay within a comfortable range of motion as you rock back and forth for 6-8 repetitions. 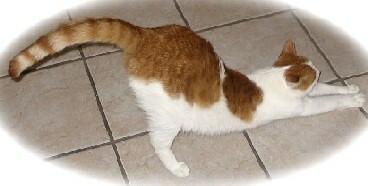 Leave the cat stretch and find more free Pilates articles and information from my home page. Pilates Roll Up, with progressions anyone can do it. Get your Pilates Workout Video on the Mat or Ball here. Single Leg Stretch for your abs and lower back. Pilates Saw for Core Strength and Flexibility!